When I was a kid I loved everything sweet. I never missed an opportunity to eat a cookie or candy. Never. But even though nutella is a very popular breakfast item among a lot of German children, I was never a nutella kid. Sometimes we asked for a jar. My father would refuse and we’d start begging and begging until he gave in. He bought it even though he knew that it would sit in our pantry forever, about three quarters left, and nobody would ask for it again. How could that happen? Well, my parents did not allow us to eat the spread straight from the jar, as we had intended. They wanted us to eat it on a slice of bread. “What is your problem?”, you think. A slice of crispy warm toast with hazelnut chocolate spread is the best thing ever. Yes, that might be true. But the bread my parents used to buy wasn’t white wheat bread made with yeast. It was a fantastic sourdough bread made with both wheat and rye flour. Don’t get me wrong, we loved that bread. My parents usually bought a fresh loaf from the bakery right next to our house. It was so good straight from the oven! It had a wonderfully shiny and crispy crust and a perfectly soft, pillowy crumb. My mother would often get annoyed with us because of that bread. We’d cut it into thick slices, rip off the crust, eat it and then devour the crumb. My mother would buy a loaf around noon and when my father came home in the evening, there was almost nothing left. The bread was great with everything savoury on top since it had a strong sourdough flavour. But this flavour was also the reason it didn’t go so well with jam or nutella. And so although that bread was one of our favourite foods, it ruined nutella for me. Okay, this is not entirely true. Because even if my father had told us not to eat that hazelnut chocolate spread right from the jar, we still would have done it. After all we were regular kids. The truth is, I simply didn’t share my schoolmates’ love for nutella. Because I wasn’t a real chocolate kid. I liked things made with chocolate, for shure. I liked all kinds of chocolate bars filled with caramel, nougat, or nuts for example. You know the kind I am talking about. But the combination of cocoa powder, hazelnuts, and vegetable oil found in nutella just was too much for me. It was too rich. I couldn’t eat it. It was also the cocoa. because cocoa powder mixed with vegetable fat simply isn’t chocolate! And that was the simple reason why the jar of nutella was collecting dust in our pantry, just like my father had predicted. The chocolate I loved had something in common with nutella though. It wasn’t real chocolate, too. It had no chocolate liquor. It was white chocolate, the kind that is so awfully sweet. If there had been a white chocolate version of nutella, I know I would have bought it! Giving up the taste of white chocolate was one of the hardest things to do when going vegan. Over the years it has become easier to find vegan white chocolate and I am really happy that I can enjoy it again. My favourite kind has a ridiculous name and is available in bar form and in 500 g (1.16 lb) bags. I used to treat myself to such a bag whenever I ordered vegan stuff online, which was probably two or three times a year. But now I am back to unlimited access, because of Kokku, a vegan online store. They are based here in Dresden and have their warehouse only five minutes away from where I live. And If I order stuff there, I can usually pick it up the same day. And of course I am ordering white chocolate! It’s a weird feeling when you finally have easy access to a rare food again. Because you learned to live without it. You survived the cold turkey phase and then you stopped thinking about it. White chocolate is something special. All chocolate is, as we often forget. I cannot eat it straight out of the bag anymore, I have to put it to good use. So I finally made this incredible crunchy white choclate spread, a vegan white nutella. And yes, eat it straight out of the jar if you feel like it. Or on toast! And stay tuned if you want to use this in a recipe for white chocolate lemon tartelettes. That is coming up next! 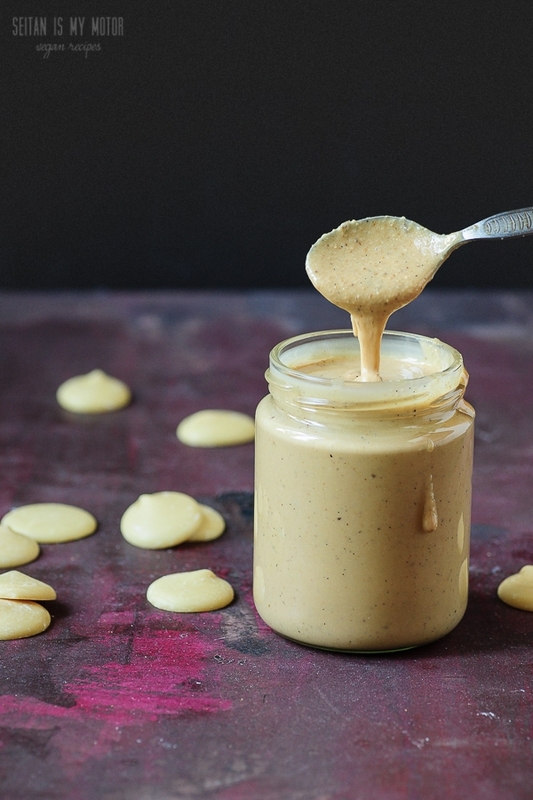 This vegan white chocolate spread is a delicious alternative to a regular chocolate spread. It's made with only a few ingredients and comes together in no time. This spread is best kept at room temperature. If youn want to store it in the fridge, make sure to let it sit at room temperature for about 1 hour before serving. 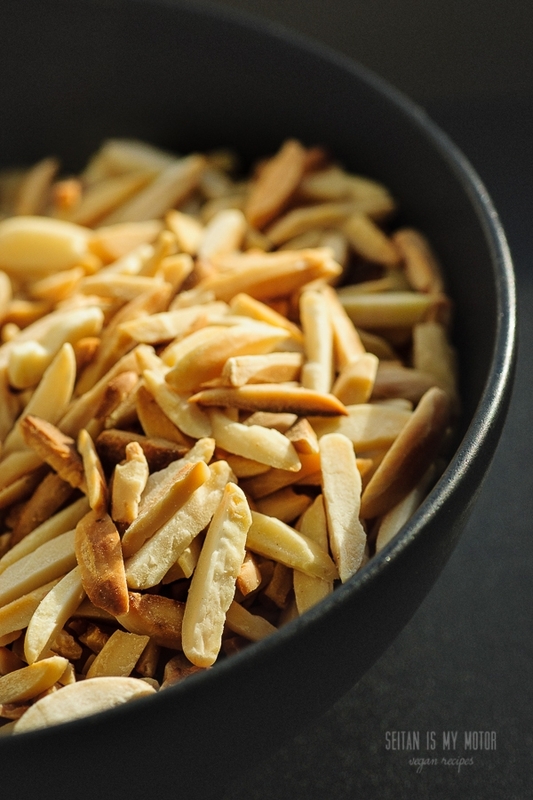 Place the almonds in a small pan and toast them until golden brown. Let cool to room temperature. Add almonds and oil to a food processor and grind until the nuts start to release their oils and the crumbs turn into nut butter. Depending on your food processor, this may take a while. Scrape down the sides from time to time and make sure not to overheat your processor. As soon as your almond butter is ready, add vanilla. Blend again. Pour in chocolate, add salt, and process until smooth. For an even quicker version you can make this spread by using 150 g (5.3 oz) store-bought almond butter. © seitanismymotor.com 2015. All rights reserved. I never even heard of nutella until I was an adult… and the milk powder was enough to turn me off. If it has dairy in it – it’s just chocolate flavored. You know white chocolate is just cacao butter (fat) and sugar, right? I bet you could get ahold of organic cacao butter and make this from scratch without the candy maker doing it for you… I used cacao butter instead of coconut in a tart a couple weeks ago …so delicious! that sounds so amazing – I love nutella but in the way that I love white chocolate – its sweetness beckons but I can only have a little before feeling like I am overloaded on sugar! I always loved nutella on soft white bread but I think that the white chocolate spread might work well on the lovely bread you grew up with – what bread have you tried it on? Looks delicious, but where do you buy vegan white chocolate? There are a couple of links in the post but they only apply to Germany. Since I don’t know where you live, maybe you could try to check for vegan online stores that ship to you. sieht lecker! I have a sweet tooth but I don’t think it’s as big as my german friends who bring chocolate and sweets to every party and order white hot chocolate and slabs of chocolate cake with cream. Such fun to watch :) And yes, this spread would be delicious in a tart! First of all, I’m entirely jealous of your childhood bread situation. I want that sourdough rye bread straight from the bakery! My family bought white soft pre-sliced bread loaded with preservatives and other junk. And second of all, I had a love affair with white chocolate in my pre-vegan days too. I loved Starbucks’ white chocolate latte and continued to drink it after becoming vegan in high school until I learned the sauce had dairy in it. I was so sad! While reading this post I started dreaming of making a white chocolate latte out of your spread, but alas I’ve gave up coffee years ago. It was not to be. But I will make this and enjoy on a crusty slice of toast! Oh, lecker. I too loooove white chocolate. Being from Switzerland one of the best things in life was the white chocolate Easter bunny! White chocolate is the one and only thing I still miss since going vegan. I did try one type of vegan white chocolate but it just didn’tt taste the same, I ended up throwing it out. I wonder how the chocolate you linked to measures up? Perhaps I’ll order some and have family bring it over (living in Canada now). Unlike you, I always loved Nutella and nothing compares to it; whether store bought nor home made! Just have to live without it! I hope you’ll like it! I guess it really depends on tastebuds and time. Since I’ve been vegan for over eight years now, I don’t exactly remember how regular white chocolate tastes. By the way, that company makes white Ester bunnies, too. Oh, get out! I think I could grab a spoon and shovel that whole jar into my mouth in one sitting.